President Ron Heymann called the meeting to order. Dr. Page lead the club singing a patriotic song "God Bless America"
Recited our "Pledge of Allegiance"
Followed by singing: "I Want A Girl" and "Rotary Bonds"
In attendance were 33 Club Members. 39 total attended the meeting. Visiting Rotarians: Rotarian Chris Martin from the Amelia Island Sunrise Club. 50/50 Jack Pot: @$ 208 - Rotarian Jonathan Levitt had the drawn ticket and drew the 4 of Hearts ! 40 cards remaining. Sergeant at Arms Rotarian Larry Melnick speaking with Bob Langert, Published Author. Antoinette is attending her President-Elect Training in Orlando this weekend. Have a great time Antoinette!! Next Blood Drive is scheduled for March 20th. It is again that time of year when host families are needed for our 22 Exchange Students from Northeast Florida that will be coming to Fernandina Beach, FL, on Friday, March 29th thru Sunday, March 31st. 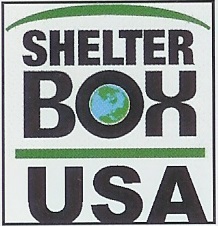 The commitment is to provide a bed for two nights, and dinner on Friday and breakfast on Saturday/Sunday. For the most part on Saturday, the students will be doing a service project, downtown, and on the Cumberland Island boat ride, and on Sunday, enjoying our beach at Amelia Island on Main Beach. If you have the time and space, please contact John Boylan at the contact information listed below. THANKS for considering! 1 Volunteer Recognition Breakfast Prices are Locked: Single seat: $15; full table of 8: $100; half table of 4: $50. 2 Volunteer Recognition Breakfast Collateral Materials are available. Katie Slaughter from Fernandina Beach H.S. placed 2nd in the District 6970 Rotary Oratory Contest....Congratulation Katie! President Ron took an open vote from the club to defer a $9,000 scholarship award to a Nassau County Take Stock In Children recipient! Unanimously, we elected to award the scholarship to be taken out of our clubs $50,000 Scholarship money we raised this year. Within the next few weeks, our Scholarship Committee members will be interviewing Seniors from the Nassau County Schools to award the Club's scholarships. More on that coming soon. WE ARE MAKING A DIFFERENCE! 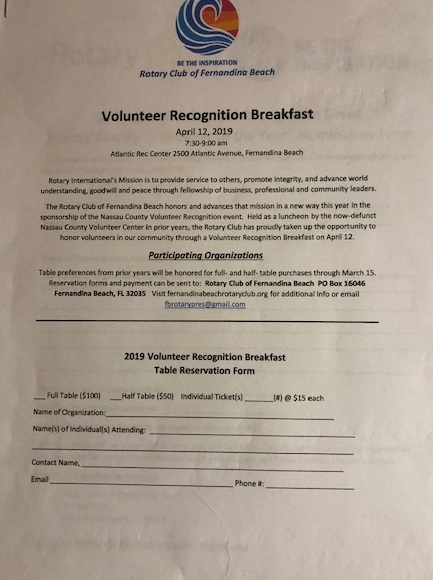 On April 12th from 7:30 to 9:00 am at the Atlantic Rec Center 2500 Atlantic Avenue in Fernandina Beach, the Fernandina Beach Rotary Club has assumed responsibility for the Nassau County Volunteer Recognition Event. SAVE THE DATE! In prior years, the Nassau County Volunteer Center (NCVC) ran this event as a luncheon during National Volunteer Week. 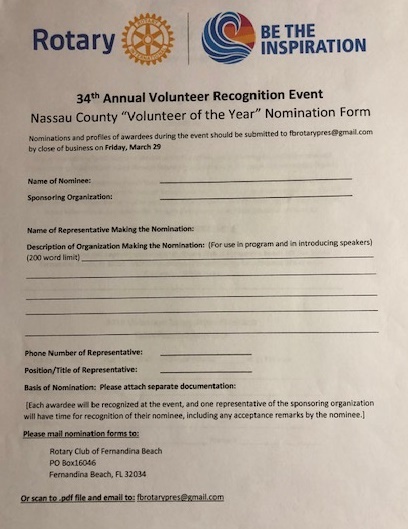 With the closing of the NCVC last year, our Fernandina Beach Rotary Club has undertaken to recognize the spirit of volunteerism throughout Nassau County, will be a breakfast, designed to provide an opportunity for any organization in the county to recognize its volunteers and in doing so, to nominate that person for the Rotary Club's "Nassau County Volunteer of the Year." Priority seating will end on March 15! Table assignments will then be first come first served basis, at the Rotary Club's discretion! Be sure to fill out your Nomination Form can be scanned and submitted to the above email address by the close of business, Friday March 29th. You can mail the form as well....just be sure it arrives at Rotary by the 29th of March. THIS IS GOING TO BE A FUN EVENT.....WE ALL SHOULD BE THERE! !